The quest for a versatile, attractive coffee table lead this writer to Sauder, the well-known manufacturer of ready-to-assemble furnishings—and to a few new pieces that have quickly become part of her family. Three years ago, our family moved from a tiny New York City apartment to a sprawling 3,000-square-foot house in Delaware. In the time since, we’ve been slowly furnishing the rooms of our new home as we better understand our needs and find the time to shop (with two kids under 6, that can be difficult). Apart from the kitchen, the living room is where we find ourselves spending most of our time. Activities include working on the computer, family game-playing, and entertaining guests. 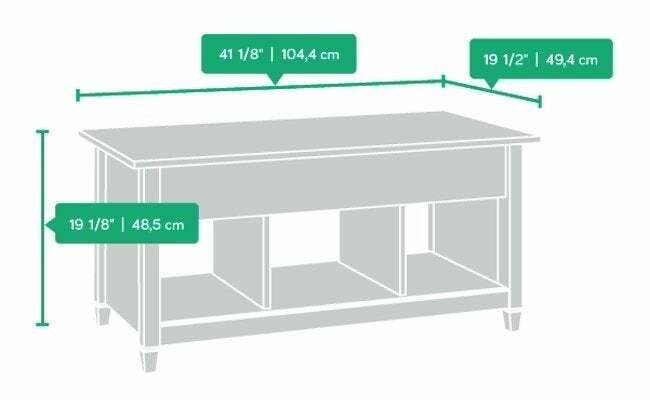 So I had been looking for a storage-friendly coffee table with the versatility to accommodate all the different ways that we use the room. That’s when I found Sauder. Founded in 1934, the company has been making furniture in Archbold, Ohio, ever since. Navigating the many options might have been tough—Sauder offers 30 distinct collections—but then I found the fun and quite instructive Find Your Furniture Style on the easy-to-use Sauder site. Somehow the tool determined that my taste is “transitional.” That seemed exactly right (and the thrill of a computer understanding my style preferences was something akin to having a fortune-teller correctly guess my birthday). Sauder’s site then recommended sets of furniture with transitional design features. I began to explore. Quickly, I found the perfect piece—the Lift-Top Coffee Table from the Edge Water Collection. I love how the hinged top swings up to create a higher surface, perfect for typing on a laptop. Meanwhile, beneath the tabletop sits a hidden storage area, and at the base there are three open cubbies. You know how books and board games, remote controls, and DVDs create clutter in the living room? 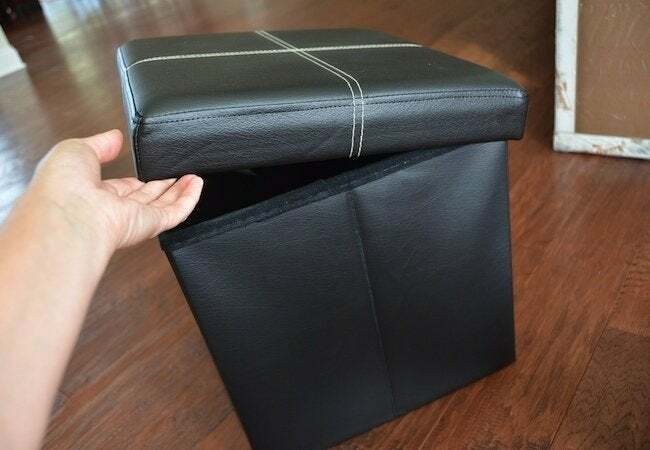 I couldn’t wait to neatly corral these things in the roomy nooks provided by the coffee table. 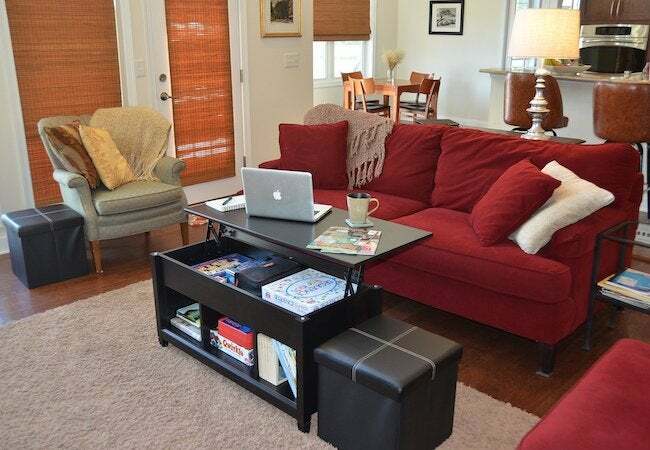 If anything were to change—and with a growing family, that’s always a distinct possibility—there are at least two or three other settings in which I could envision using the lift-top coffee table. Confident I was making the right choice, I went ahead and ordered the piece, along with three accompanying storage ottomans (we need the storage—and places to put our feet up). The online ordering process was simple, and within a week, four boxes arrived on my doorstep. The ottomans were a cinch to assemble. It took me all of three minutes. Boom! Then it was time for the coffee table. 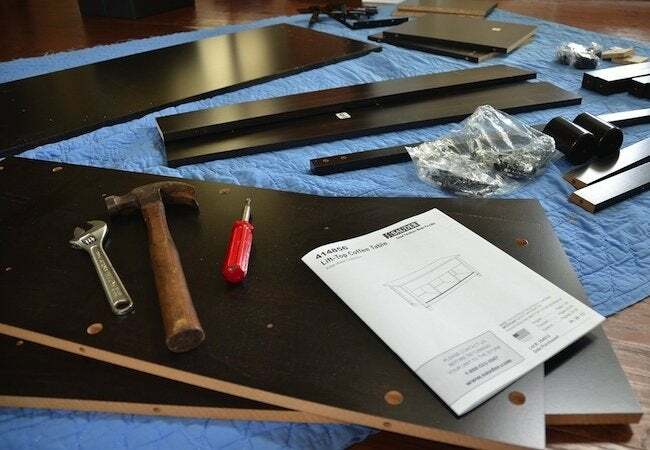 Inside the heavy-duty cardboard box, I found the wood pieces, hardware, and instructions I would need. The cam-and-dowel assembly, I knew, would be nearly invisible after construction but would create joints that, while strong and lasting, could be easily taken apart later. Having experience building similar pieces in the past certainly made things easier, but the instructions from Sauder were as clear as one could hope. If I had needed any help, I could have contacted customer service, online or by telephone, anytime Monday through Friday, between 9 a.m. and 5:30 p.m.
All told, there was only one hitch: A single piece arrived damaged. Remedying the situation was painless and took only a few minutes. 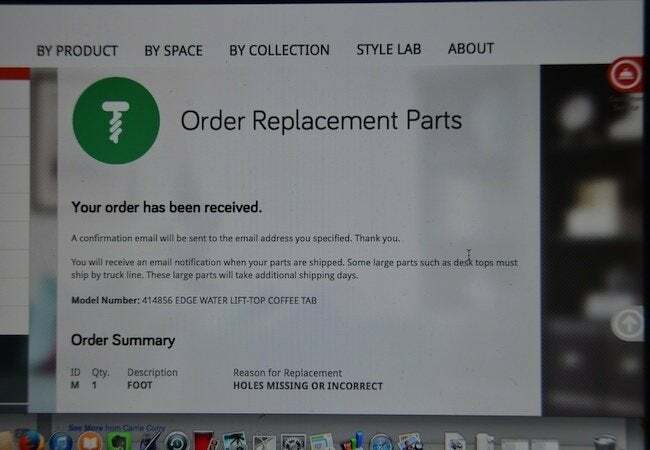 On the Sauder site, I placed an order for a replacement part, and it was delivered to my door free of charge. The coffee table is now sitting where I’d envisioned it, in the middle of the living room, and I couldn’t be more pleased. 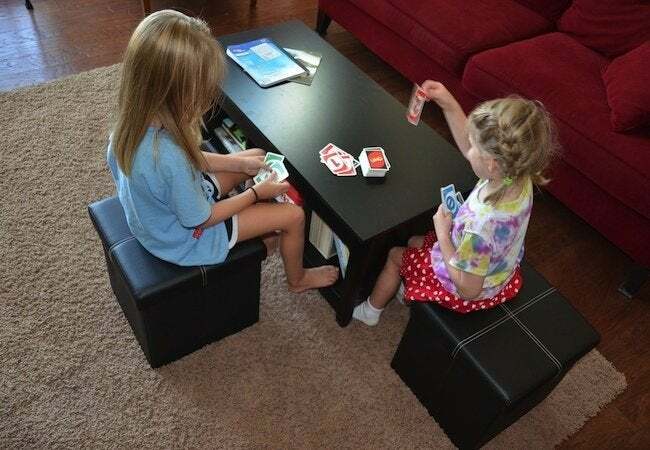 When my daughters want to play a game of Uno after dinner, they pull the storage ottomans up to the sides of the table, and it all works. We’ll be enjoying these pieces from Sauder for a long time.